This post will show you a Great Ocean Road self drive itinerary. The Great Ocean Road in Australia is one of the world’s scenic drives. We explored the magic coast by car and found koalas, kangaroos and nature wonders. In fact we have made two Great Ocean Road self drive trips. The first time we rented a campervan and took the Great Ocean Road all the way to Port Fairy from where we turned inland, to see the Grampians. Our second trip was a weekend trip by car. This time our main purpose was to spot Australian wildlife like koalas in the wild. We turned back at Cape Otway and returned along the same road. The scenery, the nature, the villages and Australian wildlife really make the Great Ocean Road an unforgettable experience. Here are my tips on what to see when driving on this spectacular coastal route in the southernmost region of Australia. This is my Great Ocean Road self drive itinerary on the map. As you can see the route follows the coast. You can take the same road both ways or return along an inland route from Port Campbell or Warrnambool. We started both times from Tullamarine Airport that has a good choice of rental cars, but of course you can rent a car in the city too. Campervan rentals are located a few kilometers south of the airport and there are none of them in the city. We have made our campervan bookings in Australia and New Zealand through the websites MotorhomeRepublic or DriveNow and everything has worked well for us, always. After an hour’s drive along good motorways, the Princes Freeway and Geelong Ring Road, it is time to turn to a smaller road and finally at Torquay you will reach the south coast of Victoria. Torquay is a famous surfing village with a pretty beach where surfers gather in the summer. One of your trips was in the middle of the winter and yet there were surfers in the cold ocean water (+12 degrees C). After Torquay comes another pretty village Anglesea and that’s where the Great Ocean Road officially begins. Anglesea has a brilliant beach and a riverside boardwalk. There are kangaroo warnings on the road but we didn’t see any kangaroos. But as we had heard that if you really want to spot kangaroos you can do it on the Anglesea Golf Course a short drive north from the Anglesea village. And that was true! We could see lots of kangaroos bouncing about the greens of the golf course. The next village in order is Lorne. Lorne is the biggest tourist resort on the Great Ocean Road and would make a good place to stay the night at. The village has a good sandy beach and a long pier and lots of shops and accommodation and dining options. About 8 km uphill (inland) from Lorne are the famous Erskine Falls. The Erskine waterfall is a big one, it is tumbling 30 m down in a deep rainforest. The Erskine Falls is the most accessible of the 1o waterfalls on the Great Ocean Road, it is easy to visit. You can easily reach the falls by car and the only walk is 150 m down steep stairs to the first lookout where you can see the waterfall. If you walk a bit more you can see the waterfall from another lookout lower down. The road to the Erskine Waterfalls is very steep. You first drive a long way uphill from Lorne and then down again in a valley. The road down to the falls is really steep and there is a warning that the descent is not suitable for campervans and caravans. But we were lucky and could see the falls. This time we were touring the Great Ocean Road by car! All other waterfalls in the same area require more walking and we didn’t have time to see them. Instead we wanted to see Great Ocean Road koalas. After Lorne begins the most scenic part of the Great Ocean Road, the high and wooded Otway Ranges. The road twists and turns and driving gets really slow. There are many lookouts so we stopped frequently for the views and to get some photos. A Great Ocean Road self drive trip by campervan is highly recommended. Driving a big campervan on the winding road is not really difficult. The only slight problem was that after each stop we had remember driving on the left side – this is Australia, not Europe. But no problem, there was always a road sign to remind us about that. There are many small rivers running to the sea like the Wye River and Grey River, and sharp turns between the rivers. The sharpest turns were where at the river mouths. Then we finally saw the first koala sign and looked in all directions to spot a koala – and suddenly we saw one hiding in a huge eucalyptus tree. That was just before where the road turns down to the mouth of Grey River. But there were more koalas to come. Kennett River is a tiny village that has a small cafe, the Koala Cafe, a pretty sandy beach and a camping ground very popular with families. On the Kennett River camping ground there were lots of native Australian birds: rosellas, rainbow lorrikeets and cockatoos, all around. There were colorful birds everywhere and we got nice pictures of them. Children were hand-feeding birds. This kind of wild parrots are a common view in this part of Australia. Kennett River is the place on the Great Ocean Road where you almost guaranteed can spot koalas in the wild. You can park your car at Koala Cafe and start walking along the Grey River Road. The Grey River Road begins right behind the camping ground, on the left. 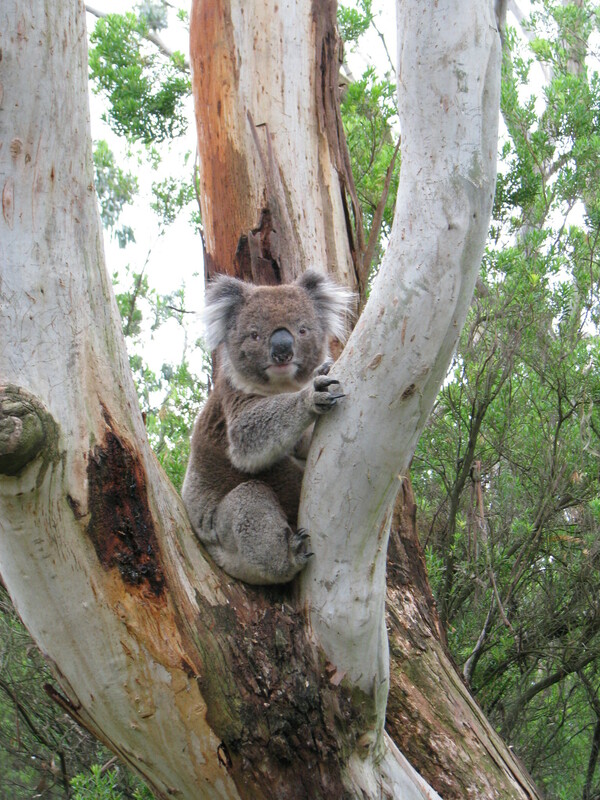 When we visited there were koalas in the gum trees on both sides of the road. We have been here three times and every time seen many koalas on the Grey River Road. You can also drive further along the Grey River Road. We drove about one kilometer up the hill and there were more koalas. If you drive 5-6 km more along the Grey River Road you will reach the Grey River Picnic area with barbeques. There you can spot glow-worms, but of course only in the night. Park your car behind the bridge and at dark walk back along the bridge. Be quiet and avoid strong light and you can see glow-worms on the ground, there are many of them. Don’t disturb the worms in any way, that makes them switch off their lights. 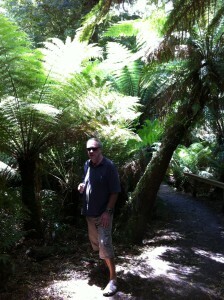 If you come to the picnic area at daytime, there’s a marked walk of about 1,5 km in a fern gully. 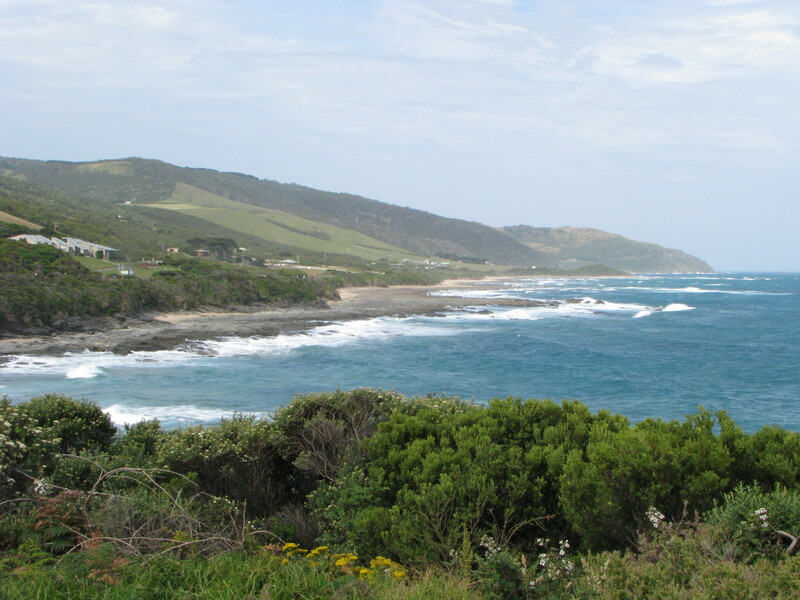 Apollo Bay is the next resort when touring the Great Ocean Road by car. Like Lorne Apollo Bay also offers a good choice of accommodation, restaurants, local pubs and small shops. Apollo Bay is in a pretty setting with mountains behind it. We stayed the night in Apollo Bay and in the pub where we had dinner among Apollo Bay locals the atmosphere was very warm and relaxed. Here are some more views from the area around Apollo Bay. Maits Rest is a small rainforest in the Otways, soon after Apollo Bay and Marengo when you take the coastal route towards Cape Otway. There is also another driving route to the west you can take from Apollo Bay. That route goes up to Beech Forest and Otway Fly, but it is much longer and not suitable for buses, campervan and caravans. The entrance to Maits Rest is easy to find thanks to the good signs on the road. There is a short loop walk, about 2 km, partly on a boardwalk. Maits Rest is a great place if you want to experience the real rainforest with lots of ferns, small rivers and old trees, and there should also be platypuses diving in the rivers. But platypus is a very shy animal and as you can guess we didn’t see any. Shortly after Maits Rest there is a side road to Cape Otway Lightstation. The lightstation is 8 km from the main road and on this road you have a very good chance to spot koalas in the wild. The place where the koalas are is about half-way to the lightstation, a bit before the Bimbi Park campground. We stopped a lot and in most places where we stopped we saw koalas in the trees. And on the way back a huge old koala was crossing the road right in front of our car. We stopped and discussed with it for a while before it climbed up the slope. The koala was so big and stared at me for a long time and it was almost frightening. But it decided to climb up to a roadside hill. The life of koalas is threatened. The kind of eucalyptus trees they need, called the manna gums, are slowly dying. It’s not really known why the manna gum trees die, maybe because they would need bush fires now and then which people don’t want. You can see areas of dead manna gum trees in the Otways, near the place where the koalas live. When the trees die the koalas have less food and they have to move to other areas. Otherwise they will starve. Cape Otway Lightstation has been here since the 1840s. It was built to safely guide all the shiploads of European settlers that were coming to Australia after they had spent months on the stormy seas. The Southern Ocean is a dangerous place. 180 shipwrecks have been recorded here and many immigrants have lost their lives. The area west from Cape Otway is called the Shipwreck coast. You can climb to the balcony for a better view of the historic place. The Ocean here is called Bass Strait. The lighthouse is a good place for whale spotting in the winter. In the winter whales migrate from polar waters to calve in warmer waters near the coast. If you’re lucky you can spot huge black and white Southern Right Whales here. We tried to spot them but they were all hiding in the waters. There is also an old restored telegraph station, a lightkeepers cottage and a restaurant. There are walking-paths for both longer and shorter walks. We did a short walk in the bush. The bush looks green from the outside but inside it’s all grey and dark. We didn’t see any snakes which is good. The most dangerous snakes in the world are in Australia. The Twelve Apostles are the most famous sight of the Great Ocean Road. And tat’s why they are the main destination of all organized Great Ocean Road tours. The rocks that are called Apostles are soft limestone formations in the sea, formed by winds and ocean waves. In fact there are only 11 Apostles since one has collapsed in 2005. These off-shore rock stacks look spectacular. You can admire the view from the clifftop or walk down 86 steps to the beach where the Apostles look even more impressive. There are also helicopter tours to the Twelve Apostles if you want to see them all from the sky. Nearby is also the famous Loch Ard Gorge with good walking tracks. Most organized tours turn inland after the Apostles and return to Melbourne along the shorter inland route. But if you have time, you can continue to Warrnambool that is a good place for whale watching in the winter and to Port Fairy. Between Warrnambool and Port Fairy is the Tower Hill Game Reserve. The Tower Hill Game Reserve is set in a very special place, an ancient volcano crater. The crater has been made a game reserve and it’s a place you can meet with native Australian animals. You can walk around or drive slowly on the narrow roads, and native Australian animals are running around you. There are at least kangaroos, emus, echidnas and lots of different birds, and also many typical Australian trees and plants. It’s definitely worth stopping at Tower Hill if you’re driving towards Port Fairy. I will end my post here. Now you should roughly know what you can expect on a Great Ocean Road self drive trip. And I’m sure you will see and learn a lot more on Australian nature on your Great Ocean Road self drive trip. Thanks Shaun, I’m happy to hear my post helps you make your presentation. Good luck with it! We have just completed the Great Ocean Drive. Your recommendations and blog was correct to the T . We followed it and really enjoyed ourselves. Thanks a lot! !